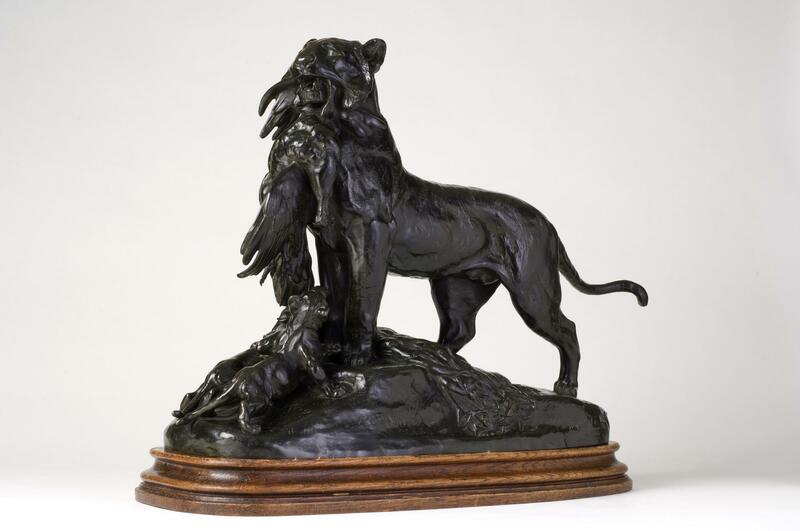 Cain apprenticed with the wood sculptor Alexandre Guionnet, an early exponent of the animalier genre, who sent animal groups to the Salon between 1831 and 1859. He went on to study modeling with François Rude, whilst at the same time spending hours in Paris’s Jardin des Plantes where he sketched from the live animals in the zoo. Cain married Julie Mêne, the only child of Pierre-Jules Mêne, in 1852. The couple had two sons, Eugène-Henri and Georges-Jules-Auguste, who went on to become the curator of the Musée Carnavalet. 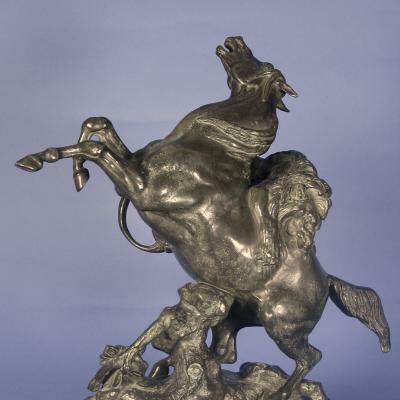 This cast of Tigresse Rapportant un Paon à ses Petits is a highly important and unique animalier example in the realm of French 19th century bronzes. 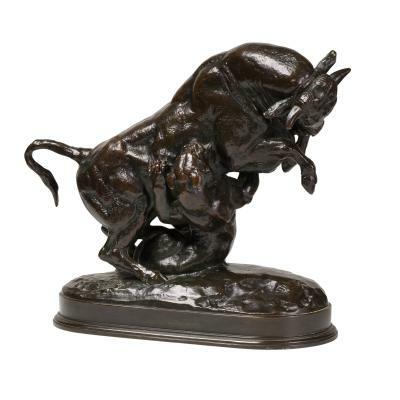 Sculpture in 19th century France saw popular works by important French sculptors cast in high numbers. Great works became pedantic by being over-produced. This is unfortunate as it lessens the impact of the great works produced during this golden era. 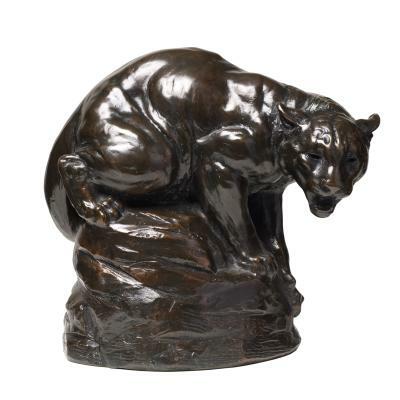 Animalier bronzes played a significant role in 19th century France and this version of Cain’s important monument is a stellar example of workmanship and bears great sentimental and historical significance. 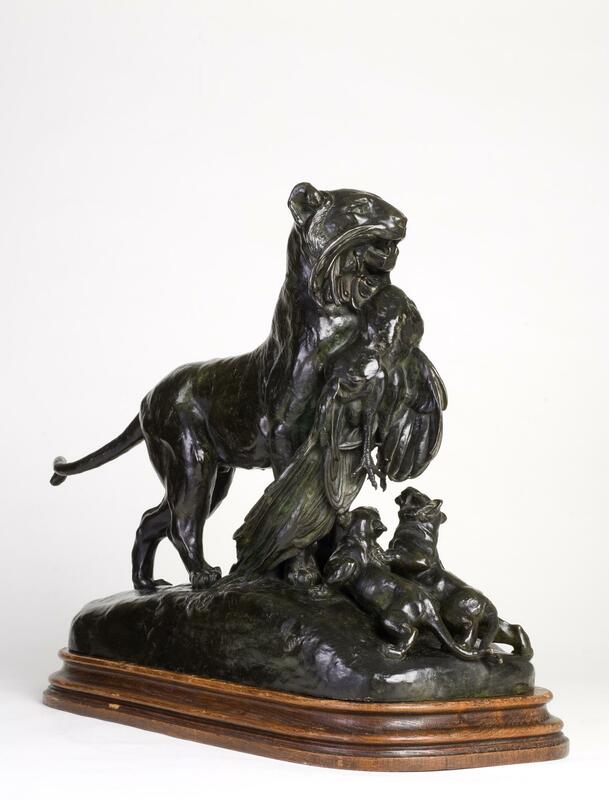 Auguste-Nicholas Cain exhibited a plaster model of Tigresse rapportant un paon à ses petits at the Salon of 1873. Much admired and receiving great acclaim, the state commissioned a monument sized bronze version. Three years later, Cain showed the impressive large version at the Salon of 1876 then giving it a title of Famille de Tigres. The bronze was installed at the Jardin des Tuileries and is considered by the city to be one of its favorite monuments. Ultimately he had four animalier monuments installed in the Jardin des Tuileries, the larger version of ours being the most acclaimed of the four. Reductions were very popular with Parisians, and the life-size tigress led to many requests for a small version. A posthumous edition by the Susse Frères foundry answered this call. However, the version we have was cast by Cain in the foundry of his father-in-law, the celebrated animalier, Pierre-Jules Mêne. 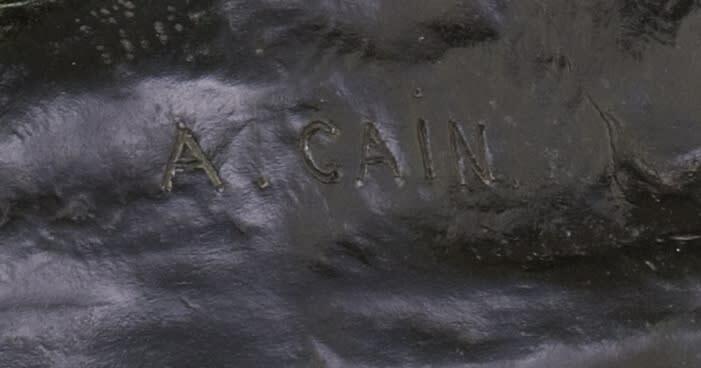 As the inscription indicates, it was the primary version in the reduced dimensions. 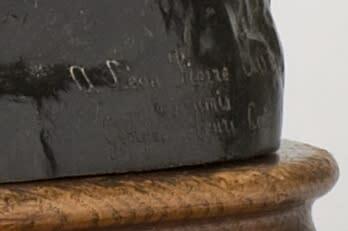 It was in the collection of the artist before it was presented to Léon Pierre Aubey, a close friend of the artist who added the personal inscription. The wonderful vintage photograph of Cain at his desk with the beloved work sitting proudly by his side is testament to his affection for it. For a sculptor, being recognized by the State in France was crucial to having a successful career. However, a special cast, small version that the sculptor would keep for himself is going to be particularly refined. And ultimately gifting it to a dear friend would assure it from being in the hands of a less worthy patron. A version of Tigress and Cubs” was donated and installed in Central Park, New York in 1867 and now resides in the Central Park Zoo. It may have been gifted by John Stewart Kennedy and Samuel Morse, the telegraph inventor. Kennedy visited Cain’s studio in France and greatly impressed by the work, commissioned one for his native home of Kelvingrove, Glasgow. The monument is refered to by several names which include “Bengal Tigress”, “Tigress and Cubs” and “Tigress and Peacock”.